Breaking String Theater was founded several years ago with the mission of bringing the works of Anton Chekhov to the stages of Austin. But depending on which Chekhov scholar you ask, the author wrote either only four or five full-length plays, and Breaking String has now staged all of them. That doesn't mean they're out of material, though. In addition to his plays, Chekhov also wrote dozens of short stories, some of which have been adapted for the stage. When Breaking String found itself with the production rights for the stage version of the short story The Black Monk, they decided to create a Chekhov short story double bill. To go along with The Black Monk, Broken String commissioned an adaptation of The Fiancée from playwright Eliza Bent. In Bent's version of the story (now titled The Beyoncé), the action is updated to 2014 Austin. The two plays will be performed with the same cast back-to-back every night. See We Play Chekhov: The Black Monk and The Beyoncé Wednesday - Sunday at the Rollins Studio Theater. For the better part of the past twenty years, Chad Salvata and the folks at his production company, Ethos, have been creating what they call cyberoperas. These works, set in a fantasy world and all featuring elaborate, colorful costumes and sets, have up to now all been live stage shows. But the newest installment in the Ethos canon, Octia of the Pink Ocean, is something different. 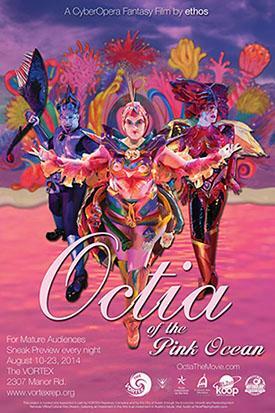 Octia is the first full-length feature film created by Ethos. Like their other works, it's an opera, set in a world of fantastical locations and characters. So why film it rather than staging it? For several reasons, according to Salvata. For one, a film will give him the opportunity to share his work with a larger audience; it'll also let him preserve it for all time. Most importanly, perhaps, creating a film and using green screen technology allows him to include sets and characters that he could never create in a stage setting. Texas Confessional is an unusual art project, in that it's designed primarily to benefit the participants rather than an audience. In its physical form, Texas Confessional is a small black chapbook made up of actual anonymous confessions. These regrets are submitted online and then compiled and printed by editor/publisher Ty Harvey. Only 100 copies of the books are made, and they're scattered around the state for strangers to find and read. Harvey strives to place the books in places where he believes they'll be read with some consideration rather than just skimmed and set aside. If you seek one out, you're unlikely to find one (there are 100 books and a little over 26 million Texas residents, so the odds aren't in your favor), but that's kind of the point. Harvey hopes that finding a confessional will be like seeing a shooting star or spotting a four leaf clover. 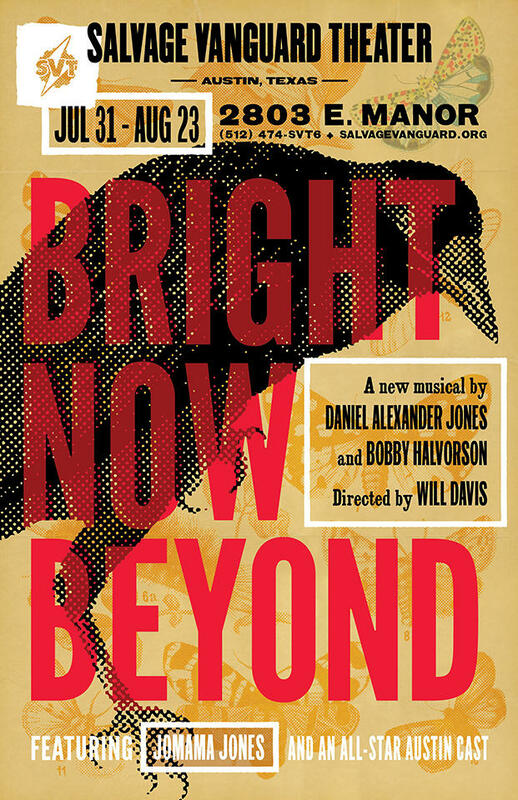 Starting July 31, Salvage Vanguard Theater will present the world premiere of the new musical Bright Now Beyond. It's an adaptation of L. Frank Baum's 1904 book The Marvelous Land of Oz (which was the second in the author's long-running series of Oz books). Bright Now Beyond is set decades after the events of The Wizard of Oz, and features a few characters from that story (the Tin Man, the Scarecrow, and Glinda the Good all make appearences) along with many new characters not seen in the classic film. Co-writer Daniel Alexander Jones sees all the characters — the familiar and the new — as being at a crossroads in their life; that's one of the things that drew him to the story.